The Art of Pooch -- It's Like Being Dipped In Chocolate! My first website -- which eventually evolved into the page you are reading right now -- was, like most first websites, bad. This page simply is a sort-of history of what I've done with my websites...how my page got to where it is today. It's largely for my own benefit and probably of not much interest to anybody; if that's the case, I'm sure you know how to use the "Back" button on your web browser. Besides...if you can't laugh at yourself (or, more specifically, your past website designs), who (or what) can you laugh at? 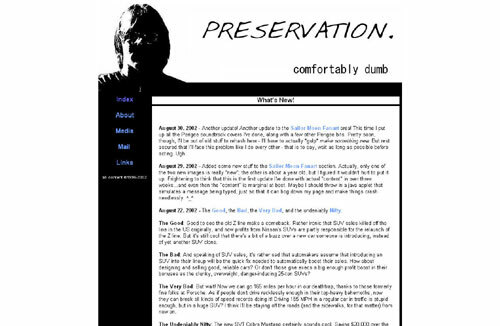 Quite simply my first website, posted on my birthday in 1999. 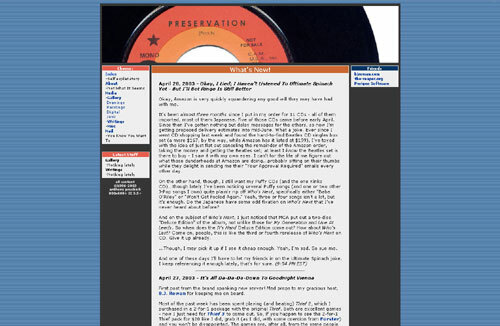 It wasn't a "personal site", but rather a bad Beatles parody site. You see, my cousin and I had been making some comics based on my friends and I in the neighborhood I used to live in. One of the stories was a sort-of Beatles parody, which I then took hold of and made into a full-blown Beatles parody (very like the Rutles). All of the album covers and pictures were drawn by me, which probably didn't make for a very convincing parody. As for the site itself, it was built with Macromedia Dreamweaver, utilized frames, and had one of the most piss-poor designs you'll ever see: bright, clashing colors, shoddy image buttons, and a cheesy repeating background. 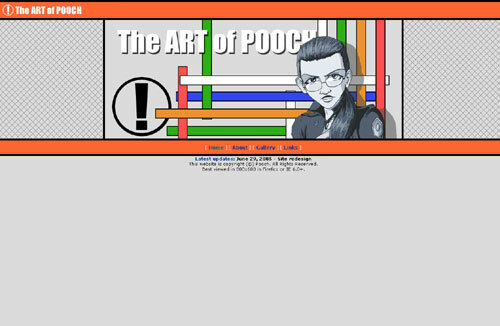 And to cap off the general air of crap about the site, it was hosted on (snicker, snicker) Xoom.com (remember them?). All in all, a recipe for disaster. Thankfully I rather quickly realized what a steaming turd the site was, and quickly moved to redesign it. Also of note: this site had an "UltimateCounter" hit counter on it. AWESOME! At this point I got rid of the frames (I was still using Dreamweaver), though I hilariously still had no concept of "formatting" -- all of the text on this site stretched across the entire screen (yeah, that looks really professional). On the webcounter front, I had traded in the awesome UltimateCounter for a WebTracker -- moving on up in the world! As for the content, it remained largely the same, which I suppose was to be expected. 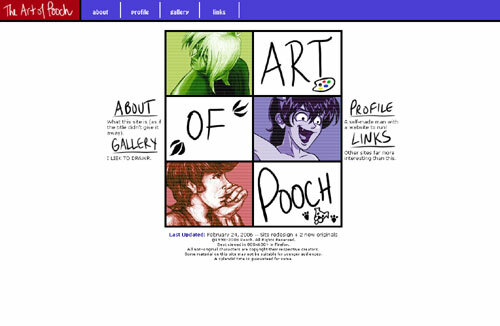 Obviously such a niche vanity site was of no real interest to anyone except for my friends and myself (the fact it was a pretty blatant rip-off of the Rutles was also a strike against it), but for some reason I had no interest in making a site devoted to my art (which I was pretty heavily into at this point, what with school and art classes and what not). Also: still hosted on Xoom.com. MEMORIES! Still using Dreamweaver, I went back to frames. I also utilized tables, making for the first time I used honest-to-goodness page formatting in one of my designs. The navigation frame on the left side used rollover images that would tell you what section you were going to when you did a mouseover. The galleries and what not also used a very rudimentary pop-up script that I ganked from a friend's site. 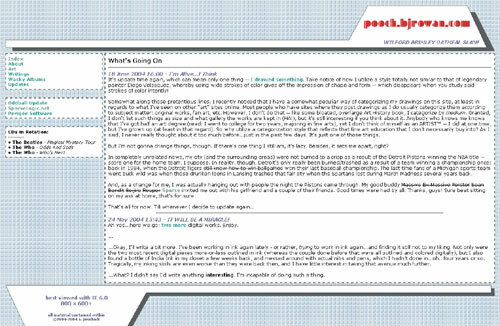 More important than all of that, though, was the fact that in September of 2000 my buddy Bandit offered me some space on his web server -- space that I use to this very day (though my address was slightly different back then, reflecting the Beatles parody site, as opposed to my current address, which reflects my name). So I bid farewell to the crap free hosting service Xoom, and actually had a site that you could access more than once or twice a day. VICTOLY! My first "personal" site...that I posted, anyway. There was a precursor to this site that either didn't last very long or was only shown privately to a friend or two before getting blown up (mainly because I felt that I was ripping off another friend's site design-wise). The Beatles parody wasn't completely dead, just moved to a subfolder of the domain, as my focus shifted to blogging and posting artwork. I was still using Dreamweaver, though I can't blame that for the rather uninspired design. Nor can I blame Dreamweaver for the fact that I named my site after an almost-universally reviled Kinks album (actually, two albums). It was with this design that I started my six-month (or so) design cycle; i.e. roughly every half year I'll tire of my page design and try to come up with a new one. Although with this design you really couldn't blame me for thinking it was garbage. Frankly, I'm surprised I didn't come to that conclusion sooner. Also, I finally tired of the whole "hit counter!" business, realizing that not only did I not get enough hits to matter, but in the long run it's quite stupid. If you make a website simply to see how many hits you can get, you're silly...or trying to publicize photos of a college roommate duct-taped to a chair with a bike lock around his neck. Looking through these old designs of mine, you'd think I had an aversion to actual color, what with all these drab neutral tones and greys popping up all over the place (I apparently realized this too, and overdid it with colors on my next site incarnation). Not much to really say about this one; it was the last time I used a frontend program to code a website, and the title image changed from time to time (the font and text blurb on the image, that is). Other than that...blah. COLOR! 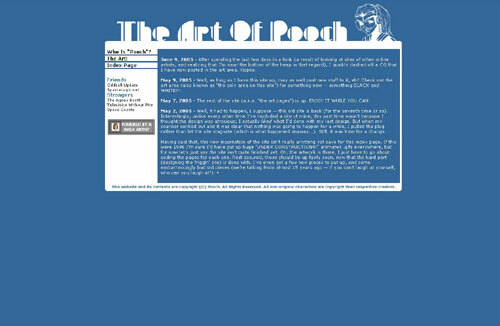 Actually this was one of four or five color schemes to grace this design; I went a little crazy with the CSS on this one (I guess I was on a natural high from finally coding my own website by hand in Notepad instead of using a frontend; and speaking of CSS, this was the first time I used CSS, aside from link decoration on the prior few designs). In actuality the design isn't too far removed from the previous one; it just had a few more bells and whistles added on (and a lot more color). I think I was finally starting to find some sort of design aesthetic here; my designs were getting to be more inspired and easier to come by (though it would take another design or two before I finally started playing with the table/cell format). ...So I guess the moral is, "Keep plugging away at something, and you might eventually become better than mediocre at it." This one didn't last long; I didn't even get around to adding my art to this version -- I just blogged a few things here and there before going back to the drawing board. Again, it was similar to the designs that immediately preceded it, which was probably why I wasn't too enamored with it on the whole. 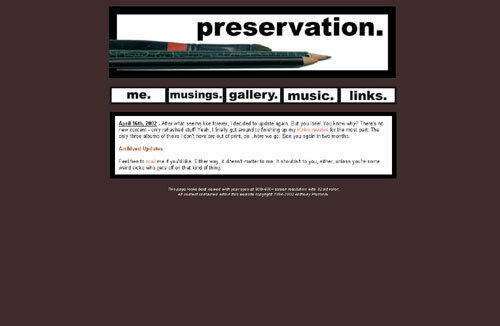 Note that this design may have been online past August 2003; that was just the last time I updated it, and I'm pretty sure I replaced the site with a placeholder of some sort, as I was wont to do back in the day whenever I tired of a design but didn't have a new one in place yet. Hey -- at least I never used one of those hideous "Under Construction" animated .gifs on any of my sites. I still like this one a little. It was the first time I used Server Side Includes for things like the menu and the like, which made changing that content easier (not that I changed that content that much). On a totally unimportant note, this design was my first to use a transparent .gif for the title images since...my very first website. The title image also had a random quote generator that spewed out such gems as "WILFORD BRIMLEY OATMEAL SLAM!" and "Welcome to the Snibblegoo sector" (the latter phrase being taken from an old comic that Bandit did way back in the day). Hee hee..."Wilford Brimley Oatmeal Slam". Hee hee. This is probably my favorite page design out of all the ones I've done. It was inspired by the Beatles' Anthology album covers, with torn posters plastered all over a wall. The design even extended to the display of my drawings, which were also mocked up to look like torn pieces of paper. So, needless to say, updates were a little more involved than simply posting a jpeg with an unentertaining blurb written underneath. This was also the first time that the update posts weren't front and center -- I'd given up blogging (since I never wrote much, and what I did write wasn't very interesting) to dedicate the site solely to my art. This design might have lasted a lot longer if it weren't for the fact that my scanner died in December of 2004; without a way to scan in my drawings, my interest in the site waned, and eventually I decided to redesign everything to give me something to do with it. Compared to what preceded it, this design was practically minimalist, with a color scheme that harkened back to my old, drab "Preservation" designs. Still, I was trying different things with table structure and the like, so it wasn't a total loss. But as you can see from the amount of time this version of my site was online (just under two months), I wasn't too satisfied with what I'd done, prompting another quick redesign. Or maybe I was finally sick and tired of using a plethora of tables on my site. Another milestone for me: I completely abandoned tables with this design (though that's not to say that I don't sometimes briefly think about going back to tables when I can't get my divs to quite work properly...). I suppose my next big thing will be learning how to finally code PHP properly...yeah, right. As for the design, I suppose it was a little garish -- bright orange against a light grey background. But it was certainly a far more inspired design that what preceded it. More CSS and div-filled goodness, this is also my first design to totally do away with the "update" blog portion; the only thing telling you about updates are the "Last Updated" text at the bottom (in the previous incarnation the "Last Updated" text was a link that took you to the update blog portion, which was essentially the same thing as the "Last Updated" text...why it took me over half a year to find out this was redundant is beyond me). Asute followers of my site will note that the screenshot isn't quite what the design looked like -- the background of the page wasn't white, it was a light blue. I took the screencap before I tweaked the background, and never bothered to update it. OOH. Yes, you read that right. I had this design up for one whole day. The idea for this far outclassed my actual execution of it, that's for certain. If I was popular or had more than two people view my site at any given time, this sort of thing might go down in infamy in that weird sort of INTARWEB way. Alas, however, it isn't even a footnote in the grand scheme of things. Which is probably for the best, since it is a turgid design, and probably best left unremembered (but then why am I writing about it on my page?). Again, the screencap is a sort of "beta" image -- the final design had a turgid, useless color bar along the top. But you don't care about that. What replaced the one-day wonder of above. The design is generally the same as #11, but with a (perhaps) more sensible color scheme than orange, green and grey. I realize that a lot of my designs share similar design structures -- and that bugs me, honest it does -- but sometimes sticking to the basics is better than oblique link images and outlandish, overfiltered sidebars and splash pages. But why should I say anything? Since I know nothing! So that's where things are right now. Come back in six months, and you'll probably see the current design archived here alongside whatever new design I've cooked up. 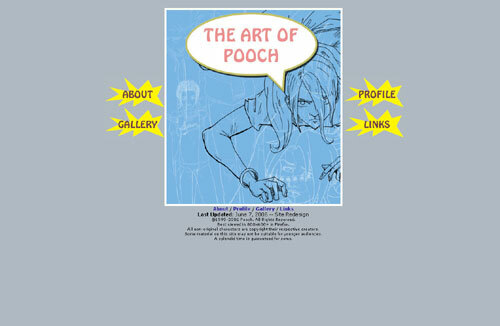 ©1999-2012 Pooch. All Rights Reserved. Best viewed in 800x600+ in Firefox. All non-original characters are copyright their respective creators. Some material on this site may not be suitable for younger audiences. A splendid time is guaranteed for some.